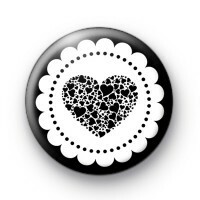 This is a black 25mm button badge with a lace pattern effect in the centre with a black heart design. Its a simple badge but great for craft projects, weddings or valentines day. We have lots of heart themed badges in the shop so make sure you check them out too.